A Twitter buddy asked me a little while ago about kid-friendly vegan restaurants in Portland, and I thought that a full blog post was probably in order to answer that question more fully: 140 characters wouldn’t quite do the trick. As the mother of a two-year-old, a vegetarian blogger (ahem), and a contributor to a Portland site for parents, I know a thing or two along these lines. Of course, kid-friendly is a wide term. To some people, it means restaurants that go above and beyond to cater to kids. For others, it means that you’ll probably be able to find a high chair and a grilled cheese (or other simple “kid” fare) if you ask nicely. These bakeries and restaurants have food that particularly appeals to kids, childrens’ menus, or play areas to keep your offspring happy. Vegan pastries at Sweetpea Baking. Photo by ndh via flickr. Mooooom, can we get ice cream? Vegan soft serve, ya’ll! Everything here is vegan AND gluten-free. Don’t forget about the location at the Tidbit food carts (where you can also find Earth Burgers). and SE Division & SE 28 Pl. When you’re out for a day of shopping, stop by for a meatball sub and chicken strips for the kids. VEGAN CHICKEN STRIPS, THAT IS. It’s a chain, but it’s a nice chain to have at the mall when you need it. This casual vegan deli has a kids’ menu featuring tofu dogs, organic tacos, or tempeh plates. It reminds me a little too much of the time I spent in Eugene, but don’t let that stop you. Busy parents, keep the takeout in mind. If you’re vegan and you’ve been in Portland for more than 2 hours, you’ve surely made it to the vegan strip mall. Sweetpea is an anchor tenant, with their bagels and schmear, honking cookies, and popular weekend brunch. Okay, if you’re downtown or in Beaverton, you can have your chain vegan lunch going, too. Ooh, crispy cauliflower in spicy orange dipping sauce? There are lots of small bites for the little ones, or ask about the kids’ menu. 3435 SW Cedar Hills Blvd. “Fish” (tofu) sandwich from Vita Cafe. Photo by sharyn morrow via flickr. Lots of vegan and vegetarian brunch items. In fact, this is pretty close to vegan, but they have cheese and eggs available, too. Beans and rice, ya’ll. Simple and easy. Ask for it vegan if you like. Ask for it without cilantro if you need to. LOTS of locations, mostly carts. People love this stuff. Kids eat for a buck every day from 5-7pm. Say whaaaat. 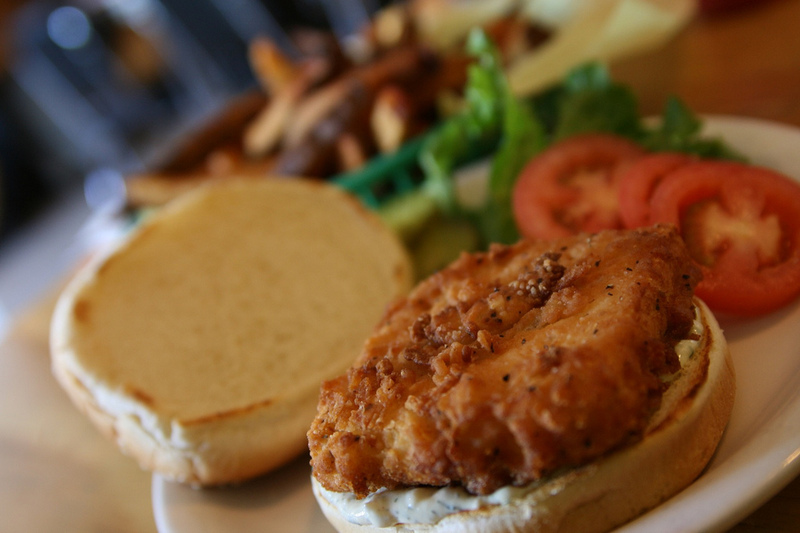 This is a “vegetarian and vegan except for the hamburger we put on there so you can bring your dad without a fight” veg joint that’s been around and loved for its vegetarian comfort food since 1999. Hopworks play area. Photo by Keri Logan via flickr. 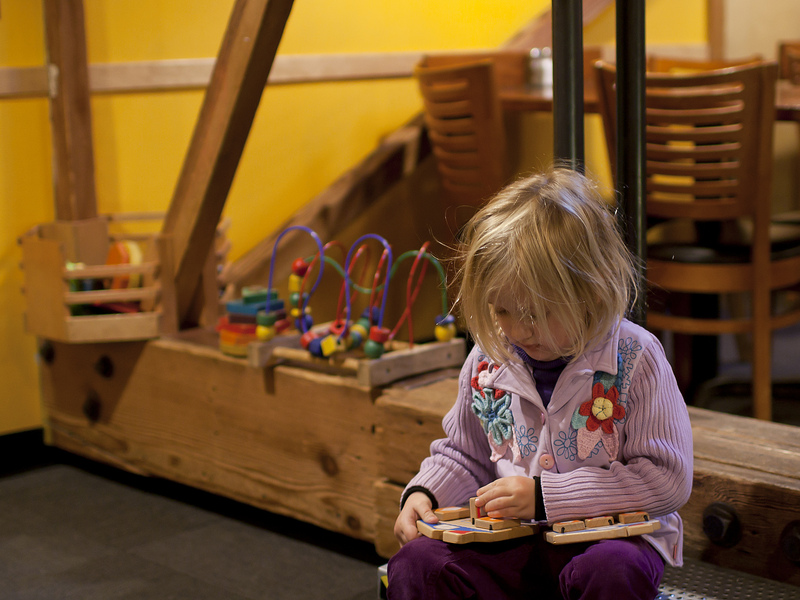 There are plenty of “play cafes” in Portland, where you can get food and coffee (and often a mimosa, ahem), and you pay a few dollars to let your kid run loose in a separate play area. Cafe au Play is a non-profit, and they have Tofutti cream cheese for your bagels, and there’s no extra charge. Donations are appreciated if you enjoy a musical act. The original brewpub on Powell is so kid-friendly that the childless think twice before going there before 8pm. Staff will probably sequester parties with children in one of two large rooms that contain train tables. You can even buy a jar of organic baby food. Plenty of vegetarian options, including substantial salads and tempeh wraps. Real talk: The food isn’t as food as Hopworks, but the beer is just spectacular. They just won another medal at the Great American Beer Festival for their Imperial IPA. More places for kids to play, more kids running around while their parents enjoy a pint. Buy your pancake batter in a squeeze bottle, and then you make your own pancakes on a grill in front of you. Yeah, kids kinda like it. There’s a vegan+gluten-free batter, or you can get them pre-made at no extra charge. Nice. Get some toppings, some vegan sausage, and you’re good to go. It’s… mac and cheese. There’s happy hour during Blazers and Timbers games though, and a full bar, if that’s something you’re interested in. Vegan and gluten-free sauce and pasta are available at an additional charge. 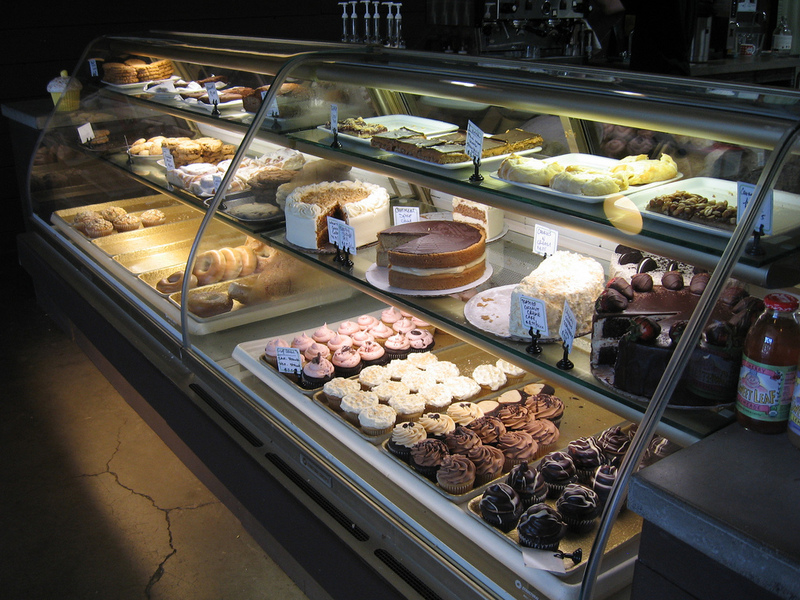 Housemade pastries, good coffee, weekend brunch, kids’ menu, and a playroom for the kids. Sounds pretty good to me, if you’re in the Kenton area. You know that when you come to Bob’s Red Mill, the dollar pancakes on the kids’ menu are going to be jammin’. Yep, that flour you see in the “natural” section of the grocery store is made in Milwaukie, and they have a restaurant and store onsite. Get those grains in bulk, take a tour, and stop for a meal. There’s even a bakery with vegan and gluten-free items available. Other favorites that pop to mind? I’d like take the kiddo back to Boke Bowl (mmm, bao) and Bollywood Theater (mmm, kati roll). What’s your favorite vegetarian-friendly restaurant to take your kid(s)? This entry was posted in How to Portland and tagged AND cafe, back to eden, bob's red mill, hopworks, kid-friendly, laurelwood, MAC! mac and cheesery, native foods, papa g's deli, poa cafe, posie's, proper eats, slappy cakes, sweetpea baking, vegan, vegetarian, veggie grill, vita cafe, whole bowl. Great list. And I’m quite surprised how many of these veggie friendly places are on the west side. It was a pleasant surprise for me, because I grew up in Beaverton, and we go there 1-2 times a month or more. Not that I’d necessarily take my parents out for fake chicken, but it’s nice to have as an option. What a great list! Our family is vegetarian, so I will have to bookmark for when they visit next. Thanks for the round-up.